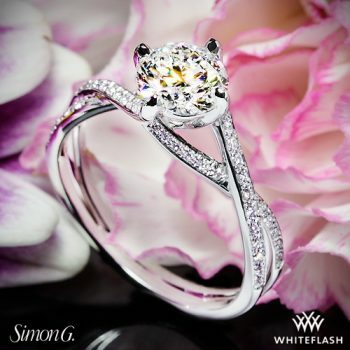 Simon G. is renowned for producing unique engagement rings that are designed to celebrate the very best in life. With over 30 year’s experience, Simon G. is an internationally recognized jewelry designer who has won a host of prestigious awards for his innovative designs, including the 2015 Jeweler’s Choice Award. When he first arrived in America with just $200 in his pocket, Simon dreamed of going to college, but he discovered he couldn’t afford any of the classes. Instead, a relative working in the diamond district invited him to work there whilst he saved up for college. Simon started setting diamonds and soon fell in love with the process, the artistry, and the details of jewelry making. Before long, what had started as a hobby became a passion. After moving to LA, he opened his own business and, as they say, the rest is history. This stand-out jewelry designer produces a diverse range of engagement and wedding rings, including everything from contemporary to classic settings. So you can rest assured that there’s something for everyone amongst his carried collections. Featuring intricate detailing, timeless designs, and the finest materials, Simon G. engagement rings never fail to leave a lasting impression. The Passion Collection encompasses a luxurious range of stand-out diamond rings featuring eye catching, colored gemstones and classic, elegant designs. Within this collection, you’ll find a wide variety of styles, band settings, and gold colors. You can even select which gold or metal you would refer the ring to be crafted from, giving the finished piece a totally unique look. The endearing Garden Collection features sophisticated floral designs and pretty butterflies. Distinctly feminine, this collection includes statement pieces boasting intricate details that create an unusual piece with a timeless, classic feel. Centered on floral pieces and butterflies, the engagement rings in this collection are expressive, feminine, and dainty. The Classic Romance Collection features stunning contemporary engagement rings incorporating intriguing geometric patterns for a unique look. With many of the rings in this collection featuring two or three gold tones, these inspired designs incorporate many designs in their timeless settings – ensuring that they turn heads wherever you go. Simon G.’s Mosaic Collection epitomizes luxurious glamour and mesmerizing beauty. Featuring lustrous mosaic-set diamonds, rose gold detailing, and fancy yellow diamonds, the rings in this ultra-special collection will be treasured forever. The Vintage Explorer Collection features a range of vintage-inspired engagement rings that embrace classic styling, with a high end fashion edge. If you’re looking for a stand-out engagement ring that really makes an impact, the Vintage Explorer Collection is sure to offer the perfect solution. 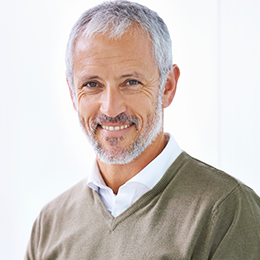 One of Simon G.’s stand-out selling points is their flawless attention to detail and commitment to delivering the highest possible level of quality. All of the brand’s engagement rings are built in line with their ‘built to last’ philosophy. And trust us, this ethos really pays off. Each and every ring they produce is of a noticeably high quality, right down to the tiniest of details. 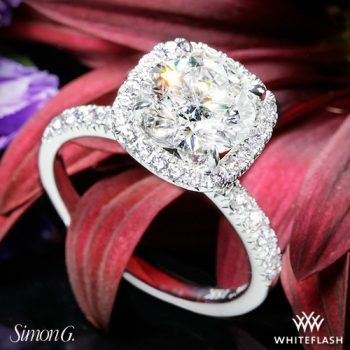 If you’re looking for a Simon G ring take a look at Whiteflash as they are an authorized Simon G retailer and they have access to their entire catalog. They also have the highest quality diamonds with their A Cut Above diamonds. As well as their impeccable craftsmanship, the brand also uses higher quality alloying materials in their rings than many other designers, in order to ensure that they deliver a flawless finish. Simon G.’s 18k white gold, for example, is alloyed with palladium rather than nickel, and their platinum is alloyed with Iridium. Finally, every engagement ring (in fact every piece of jewelry) that passes through the workshop, is put through 10 comprehensive quality control inspections to ensure that the high standards that have become synonymous with the brand are always lived up to. Where can I buy a Simon G. Engagement Ring? 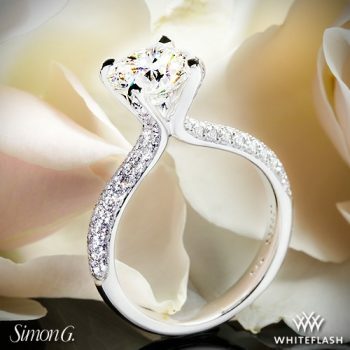 Simon G. engagement rings can only be viewed through the brand’s website however you can purchase them from one of the carefully selected approved retail stores including Whiteflash. 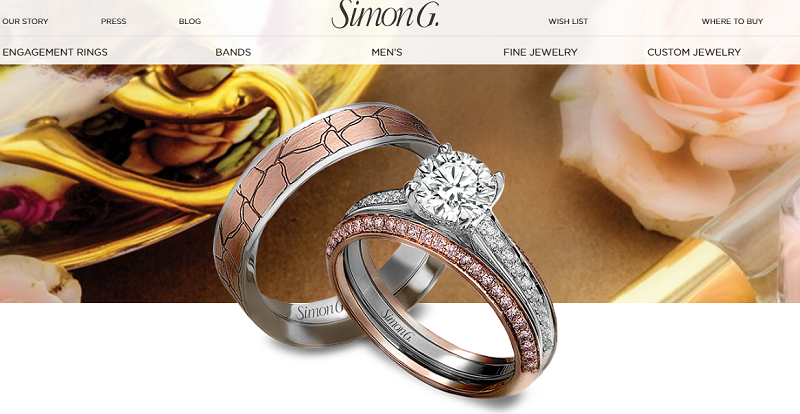 Simon G.’s engagement rings are exciting, inspired, and stylish. The large range of designs means that there’s sure to be something for everyone. Plus, the ability to choose which gold or metal you prefer is an added bonus – allowing you to totally customize your engagement ring in line with your personal taste and preferences. Every ring sold by the brand goes through 10 comprehensive quality control checks. As a result, the quality and attention to detail of their rings is unrivaled. Taking all of this into account, we simply couldn’t justify awarding Simon G. any less than 5 stars out of 5.